With a spate of prestigious properties opening in 2018, Shanghai is a luxury hotel lover’s dream. Here's a sneak peek of the city's hottest new hotels. If time is the ultimate luxury, then Amanyangyun—an ambitious undertaking spanning 15 years—is the epitome of it. The brand’s fourth hotel in China opened in January, marking a great start to its 30th anniversary celebrations in 2018. This landmark property is essentially a living museum, the result of decade-long conservation work of Chinese entrepreneur Ma Dadong and Aman. Both parties embarked on a large-scale preservation project: transporting and replanting 10,000 camphor trees, which now serves as the setting of the 10-hectare hotel, as well as dismantling then rebuilding antique houses on the site. Accommodation is in the form of these meticulously restored historic homes reimagined by Aman’s frequent collaborator, Kerry Hill Architects. In a sense, Amanyangyun (whose name means “cloud forest”) does not just aim to preserve history but also make it. Tatler Tip: Make the most of its location outside the city centre by immersing yourself in Chinese culture (calligraphy lessons, anyone?) or luxuriating at the spa—the biggest one of any Aman property. 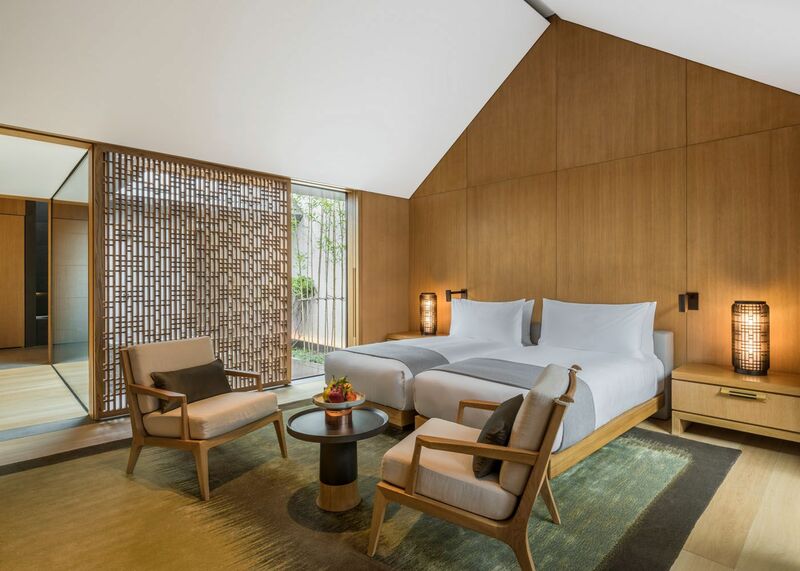 A decade after it disrupted the luxury hotel market with The Opposite House in Beijing, Swire Hotels introduces the fourth property to join the prestigious House Collective: The Middle House. Italian design maestro Piero Lissoni oversees the entire project—from the striking exterior, the interiors of the hotel and residences, down to the custom-made furnishings. Round aluminium louvers decorate the building’s façade, referencing architectural elements found elsewhere in Shanghai. While Lissoni employs his signature streamlined style, he layered it with local touches, especially noticeable in the modern iterations of traditional Chinese furniture in the guest rooms. Hotel aside, The Middle House also has 102 residences on offer, which comes with expansive outdoor areas for the sophisticated urbanite. Tatler Tip: If you're looking for more design inspriation, time your visit to these events: Design Shanghai (March) or Salone del Mobile - Shanghai (November). There’s much to expect from a brand helmed by the inventor of the boutique hotel category himself, Ian Schrager. A collaborative endeavor with Marriott International, the Edition line of lifestyle hotels is aggressively expanding this year, with 8 properties in the pipeline including this one in Shanghai opening in March. The central location is a statement in itself—setting up in Nanjing Road East and Henan Road in Puxi, west of Huangpu river, just a 5-minute walk from The Bund. Envisioned as an “all-in-one” venue, Shanghai Edition occupies two towers with 147 guest rooms, 10 floors of public spaces, and myriad entertainment options including a Japanese restaurant, a member’s club bar as well as an indoor nightlife venue. Tatler Tip: Even if it's not art week in Shanghai, there are plenty of ways to immerse yourself in art given Shanghai Edition's proximity to the Bund. Step back in time to the French Concession in the 1930s as you walk through the narrow lanes separating this hotel’s 55 one to three-bedroom villas and 40 serviced residences. Located in the last remaining cluster of shikumen (stone gate) townhouses in Xuhui District’s cultural preservation zone, Capella Shanghai exudes effortless chic with interior designer Jaya Ibrahim’s signature Indonesian panelling blending seamlessly with the original structure to create a contemporary European-Oriental look. Relax in the common spaces decorated with 1950s-themed paintings and rooms dressed in neutral palettes and lush fabrics. Tatler Tip: Authentic cultural experiences is within reach at the Xuhui district, but you'll find even more intel with Tatler's insider guide to Shanghai.